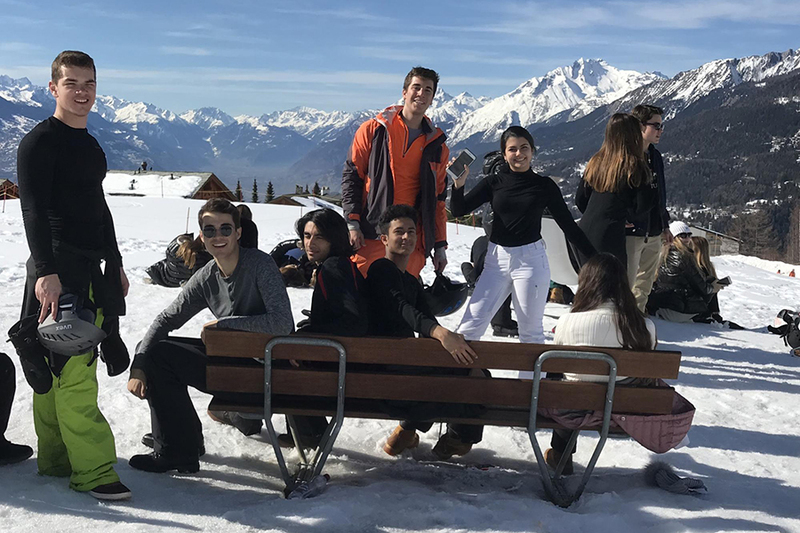 I speak for the majority of students when I say that High School Ski Adventure is one of the most anticipated Academic Travel options that students and teachers alike have an opportunity to partake in. 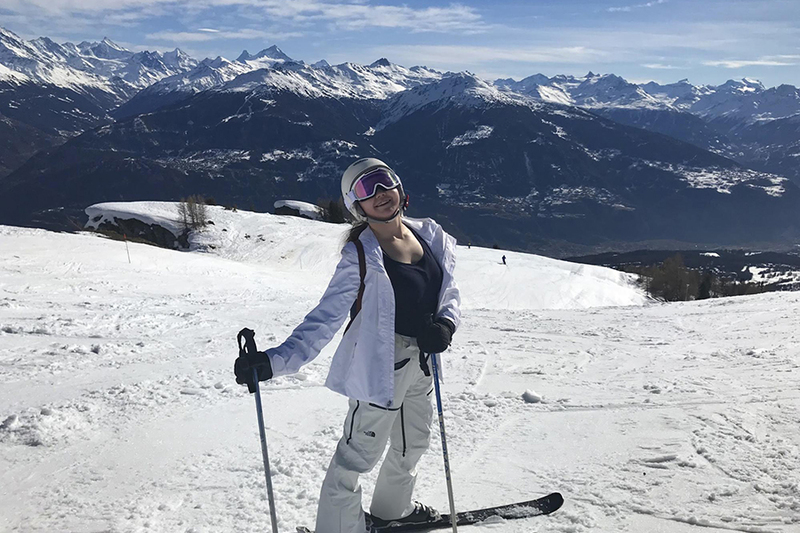 Even if you don’t necessarily like skiing or snowboarding or have never had the experience before, when you ask people who have gone in the past, they always refer to it in the most positive light and describe it as a very wholesome experience. I can now attest to that statement. 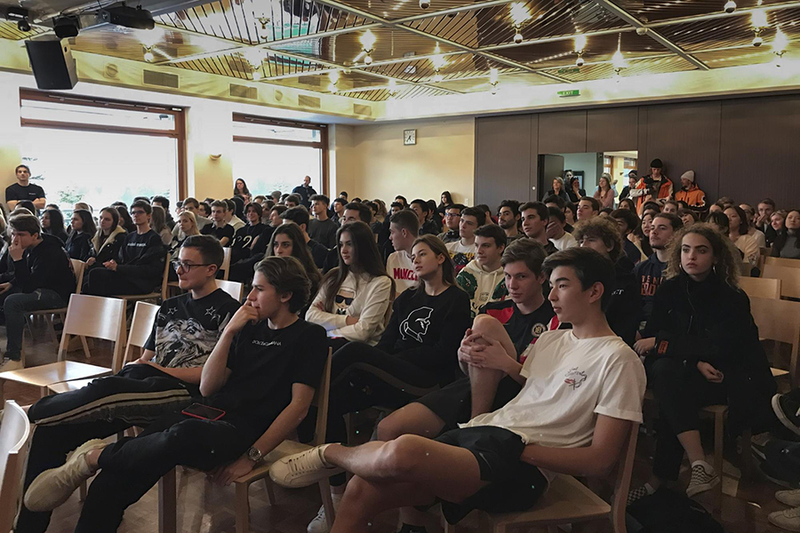 You could feel the excitement from the students and teachers grabbing their bagged lunches in De Nobili before hopping on their buses to venture off into the mountains. The four-hour bus ride to Crans-Montana was like any other. You sat with your friends, listening to music or having lighthearted conversations until you reached the rest stop, where it seemed the entire school was raiding one small counter to hurry up and buy as much junk food as humanly possible in the 15 minutes the chaperones granted us. The enchantment that filled everyone when we approached the mountain was unimaginable. Everyone knew, as if in the same instant, when we were getting close to La Moubra. I, like every other student, was excited to see where we’d all be residing for the coming week. But most of all, the breathtaking view of the mountains from the balconies of the dormitory was the sight to see on this trip. It was almost as if a little piece of the school, with its own renowned mountainous view, followed us on this trip and placed itself in front of us as a reminder of our home. Settling in was hectic but entertaining when all the girls on one floor ran around trying to figure out where their other friends were lodging. It was truly a sight to behold, especially for the chaperones who attempted to avoid the chaos at all costs. The rest of the first night was surprisingly peaceful thanks to the exhaustion from traveling, unpacking, and running around...until the next morning. The first day of skiing. I can only imagine the burden on the teachers’ shoulders the morning of the first day of lessons—the first time the students would be on the mountain and would have to go rent their equipment. As crowds of students shuffled around to the different rental shops, I was grateful that I was one of the first to finish gathering my equipment. But the lack of confidence truly set in when I got to the base of the mountain and met my instructor. Though I had extensive experience with skiing before, I hadn’t skied for about four years. I glided on over to my instructor and met my group for the week. The lift up to the top of the mountain was the ultimate tranquility. Regardless of the challenges, I’m sure everyone—students and teachers included—had an exhausting yet gratifying first day on the slopes. The feeling of the good, soft snow on your skis or snowboard or the first time you made it down a slope without falling was accompanied by such a great feeling of accomplishment. That day, though extensive, was delightful. The second day of lessons was far calmer than the first. The majority of students had already learned the best way to efficiently arrive at the gondola at the mountain’s base and avoid the morning crowd that usually formed later on. This day was also far more challenging within my group due to the advanced slopes our instructor led us down. But I am now grateful that we did so because it gave me a new perspective on having control rather than having speed when you are in an unsure situation on the mountain. The other positive part of going up to the challenging slopes was the experience of being relieved when you made it down the entire mountain and the excitement when you caught the lift to go back up and try again—this time, hopefully, with less concern and more confidence. 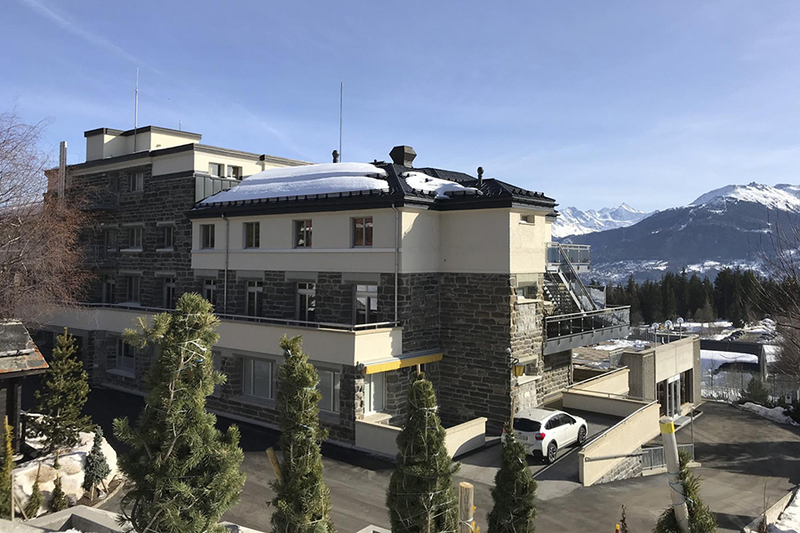 The breathtaking views, though, pertained not only to the hotel but also to the surrounding areas of the mountain we skied on. Being up on that mountain isolated us from any issues we left behind at school. Whether it was stress over tests, social drama, or just fatigue from staying in the same place for so long, it was amazing to be taken out of our own heads and to enjoy something so thoroughly with our friends. That night, my friend and I joined the school’s community event of rock climbing at a local gym next to the dormitory. The event was thrilling because I hadn’t gone rock climbing in so long, but it seemed like this was the week to try new athletic areas that we weren’t necessarily comfortable with before. Another day passed by and the myriad of sore body parts really began to sink in. 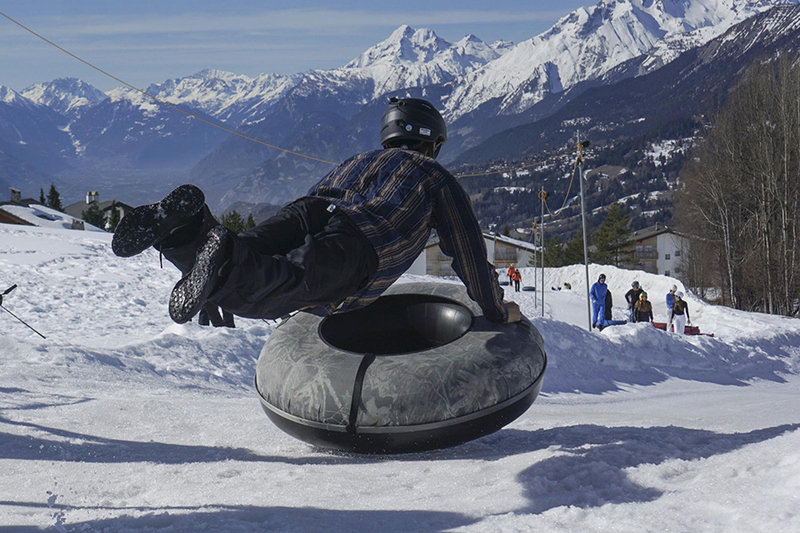 Thankfully, though, the fourth day in Crans-Montana started with a fun sledding activity that quickly turned into a mass snowball fight. Being able to mingle with my friends in the snow was really nice because it seemed like we all needed a break to just socialize and relax. Later that afternoon, there was an optional skiing lesson that I felt I could not pass up. 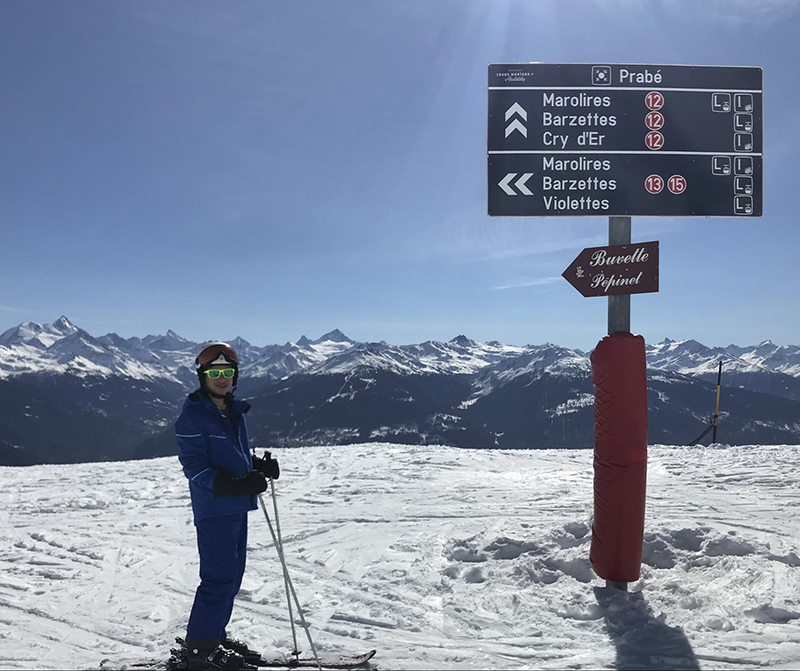 These optional lessons were by far the highlights of my week because I had the opportunity to ski with a mixed group of students and one of the organizers of the whole week, Mr. Lim. The freedom and trust he gave us were amazing, as we felt free to ski independently while knowing that we were safe because he was still there for us. I was also exposed to new trails, and it was surprisingly fun learning how to deal with new terrain and challenges. The famed Casino Night was hosted at the dormitory after the lessons that day. The room that night was filled with enthusiasm while students attempted to win “money” with which they could buy their desired prizes. Day three of our official skiing/snowboarding lessons commenced as we all gathered downstairs at breakfast to catch the bus up the mountain. Wednesday seemed like it would be another normal day on the slopes, but in the afternoon my group was faced with many different challenges concerning mountain survival. We participated in several safety instructional activities, including how to get an injured person down a mountain, how to navigate around the mountain using a map and compass, and how to detect and rescue bodies trapped under the snow in the event of an avalanche. This was a successful day overall, as we had all learned the basic mountain survival skills by the end of the afternoon. Thursday, though it was the last official day of skiing and snowboarding, was my favorite day of the week by far. The students were again allowed to participate in an optional afternoon lesson after a heartbreaking goodbye to their instructors in the morning. It was also heartbreaking during the awards ceremony and final dinner together because of the acknowledgment of this week being Mr. Lim’s last Ski Adventure with TASIS. The final night was a great recap of the entire week, as awards were given out to those who stood out to their instructors and to Mr. Diviani, the Ski Adventure Coordinator. Mr. Diviani and the entire Ski Adventure team thanked Mr. Lim for his dedication not only to the school but also to this particular Academic Travel trip through the years. The next morning was hectic, similar to the day we checked in. All the students were hurrying around to finish packing and clean up after themselves to help the workers in the dormitory. Finally, the buses were all packed up and everyone progressively began to depart the hotel and head back down the scenic route of the mountain. And just like that, all of us were back on campus, settling back in our dorms or going home with our parents. Ski Adventure was an unforgettable experience and one that I am so grateful I got to share with my peers and my teachers. I had the opportunity to really bond with my teachers during this trip, which I never expected. I especially want to thank Mr. Lim and Mr. Diviani for organizing the entire week, as they’ve done for the past few years. As a great admirer of Mr. Lim’s leadership, it meant a lot that I was able to share his last Ski Adventure with him. My mom always tells me that if I went to school in Switzerland but didn’t go skiing within that time frame, I didn’t really go to school in Switzerland. Though I did, regrettably, think about trying to get out of the trip at one point, I am glad that people pushed me to go on it, and I wouldn’t trade the experience for anything—despite the bruises and challenges. It is all worth it, in the end, to feel like you’ve achieved something so grand as attempting a new sport while being able to enjoy it with your friends at the same time. 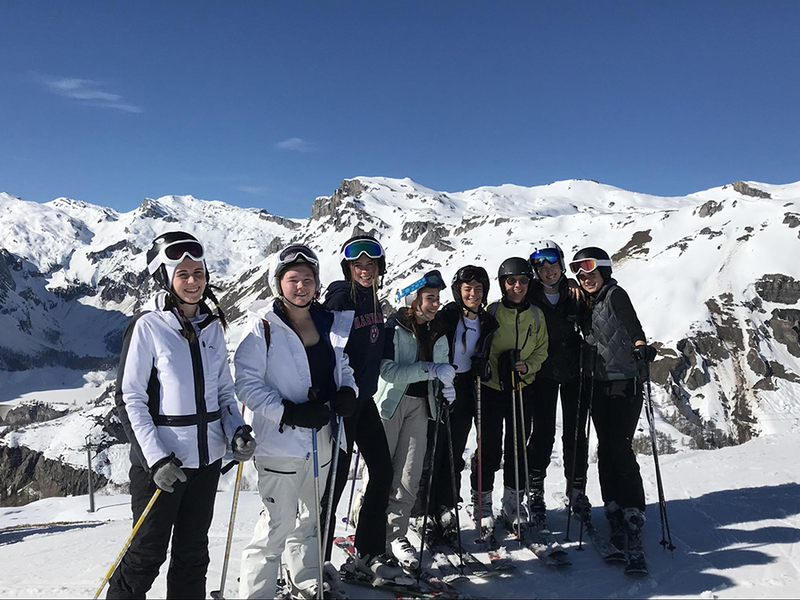 See more photos from Ski Adventure 2019 on the TASIS SmugMug page. See Ski Adventure videos here.